In the late 17th century, before Smeaton was born, most buildings were designed by architects, with military engineers carrying out other kinds of structural work. The Industrial Revolution, which began in 1733, brought unprecedented need for factories, transport links, infrastructure and everything associated with the growing size of towns and cities. This created opportunities for non-military men such as Smeaton. As we've seen, his career mirrored the developments of the Industrial Revolution in Britain, providing him with ample opportunities to demonstrate his talents. When he began, the technicalities of mechanics, hydraulics and structural analysis were not as well understood as they are today. However, engineers have always required knowledge of such disciplines as mathematics, geology, materials science, surveying, estimating and management. It was his recognition of the need for a multi-skilled approach to problem solving that made Smeaton a pioneer of engineering. Smeaton saw himself as a professional independent designer of schemes  an engineer for contractors and suppliers to consult  and he began calling himself a civil engineer. The first recorded mention of the term was applied to Smeaton and Thomas Yeoman in a 1763 London directory. His professional approach extended to all areas. When asked to comment on the work of others, he replied that it was "contrary to the usual practice of professional men to give their opinions upon each others work". By contrast, he was happy to recommend his colleagues to clients. John Gwyn, William Jessop and Mathias Scott were some of those who benefited from this. 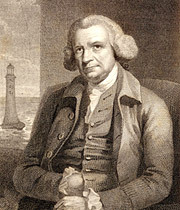 As a pioneer, Smeaton was of necessity self-taught, developing ideas from first principles and refining them over time or with the input of additional information. He believed that it was neither feasible nor desirable to produce the best possible design "at once". He optimised results by introducing incremental changes and monitoring outcomes. For his design work, Smeaton usually prepared a sketch that was turned into working drawings by his draughtsman. His daughters often helped with the shading. In 1760, when he was 36, he decided that Austhorpe Lodge, which had been closed up since his father's death in 1749, would be a good base for his consulting practice. A purpose-built four-storey square tower would became the hub of his business. In all the time he was there, he worked with only two draftsmen: William Jessop and Henry Eastburn (1753-1821). In the Austhorpe tower, according to Samuel Smiles, "The basement contained his forge; the first floor his lathe; the second his models; the third was his drawing-room and study; and the fourth was a sort of lumber-room and attic". He made astronomical observations from the roof. He used the morning for professional studies and the afternoon for experiments or practical activities. Once in the tower, no one was allowed to disturb him. Perhaps as a result of his time in the legal profession, Smeaton had a good grasp of ethics and fee scales, and appreciated the need for precise language in his written work. His reports usually offered viable alternatives, with cost estimates and contingencies. This approach to consultancy is still used today. Furthermore, he defined clearly the management structure on site  chief engineer, resident engineer, surveyors, foremen, workmen  with their accompanying duties. He appreciated that resident engineers needed both technical and management skills, noting that the ideal candidate "requires so great a number of qualifications that I look upon it as impracticable to find them united in one person". Smeaton sometimes received a salary but he had also set fixed charges. There was a standard fee for consulting engineers and land surveyors in the early 1760s: 1 Guinea per day plus travelling expenses. However, in May 1767 he set up his own fee scale: 1 Guinea for a consultation "at home", 2 Guineas "if sent for" and 5 Guineas "if employed the whole morning or day in London". In 1768, he altered this to two and a half Guineas per day plus coach and chaise hire. He also set rates for routine designs done at Austhorpe: 25 Guineas per water mill and 30 Guineas per windmill. The present day Institution of Civil Engineers (ICE) owes much to Smeaton, as well as its forerunner the Society of Civil Engineers. The society began on 15th March 1771 as a fortnightly dining club where members discussed all manner of topics. Yeoman was the first president. Founding members include Smeaton, Robert Mylne, Grundy, Joseph Nickalls (c1725-93) and John Gott (1720-93). Within 20 years membership had increased to more than 65, about a quarter of which were recorded as "real engineers". The society was disbanded in May 1792 by mutual consent after some (unspecified) poor conduct by a member towards Smeaton, but was reformed by Jessop, Mylne, John Rennie and Robert Whitworth in April 1793. The "better and more respectable" body was organised into three classes of members: engineers, general members and honorary members. After Smeaton's death, the society became known as the Smeatonian Society, the name it still bears. The ICE was formed in 1818 to address the need for a more technical professional association. Its crest incorporates an image of Eddystone Lighthouse. In 1820, Thomas Telford became its inaugural president. We have the Smeatonians to thank for the almost complete set of Smeaton's reports, published in three volumes after his death. The society's committee had decided on publication in February 1795 and Sir Joseph Banks (1743-1820), President of the Royal Society, purchased all Smeaton's extant paperwork from his executors "for a considerable sum" to that end. Austhorpe Lodge, Whitkirk  birthplace of John Smeaton, family home and later a base for his business as well. Presumably the tower we can see centre left is the one he built especially and occupied when working.